Ideas for this one came to me while thinking about the RP aspect of a medic. Life isn’t sunshine and sprockets – sometimes there are hard decisions to be made, and sometimes we are the bearers of bad news. And with being a priest, there’s always darkness where there’s light. Finally, there’s a theme that’s been the driving force of this entire expansion: dealing with our inner demons of despair, doubt, fear and such. We’re battling the Sha ingame, but we’re also very often dealing with our own RL versions of them. 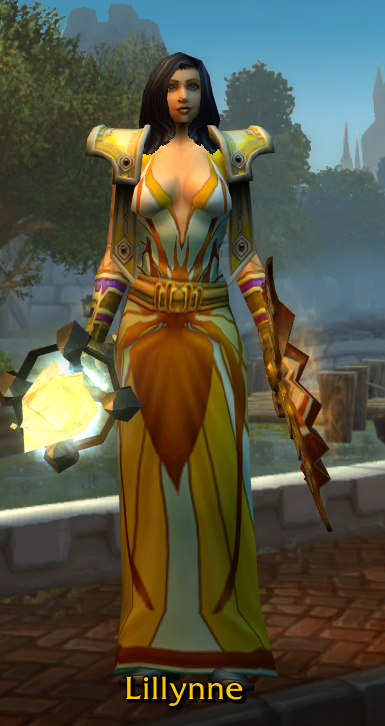 My latest outfit involves an elusive robe that is in warm colours and looks quite stunning – Chan’s Imperial Robes. These robes have quite the controversy surrounding them.